Right here in the Region, Indiana University Northwest offers more than 70 degree programs, flexible learning options, and a supportive community that’s the most diverse of any IU campus. It’s a winning combination with faculty/student interaction at its core. Our faculty are not only brilliant researchers and sought-after experts, but they’re also committed teachers who do their best to instill passion in their students. Case in point: faculty members regularly take students under their mentorship and involve them in innovative research typically reserved for graduate students at larger universities. Peter Avis, Ph.D., and Magdalena Barajas are working to identify a new species of fungi. According to Vicki Román-Lagunas, Ph.D., executive vice chancellor for academic affairs, this approach is central to the educational experience at IU Northwest. ”We think it’s important to provide students with opportunities for hands-on learning. Encouraging them to take on research projects is one way we help students pursue their passions,” she says. Román-Lagunas points to the sciences as a recent, shining example of the groundbreaking research taking place across campus. 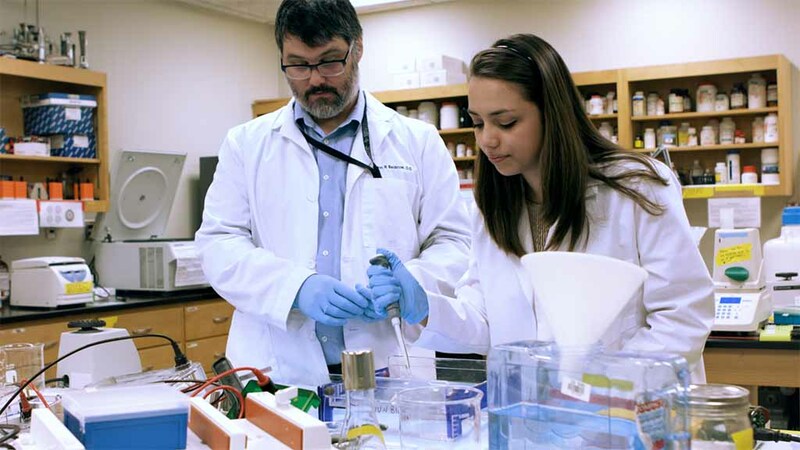 Here she shares highlights from four pre-med faculty and student research projects. Could stress in zebrafish unlock answers to treating anxiety in humans? Amy Aponte, of Crown Point, a 2018 psychology graduate who plans to pursue a career as both a medical doctor and neuroscience researcher, conducted research alongside Maureen Rutherford, Ph.D. The pair are studying stress responses in zebrafish, which surprisingly, have similar neuro anatomy to humans. After studying the existing literature on the topic, Aponte and Rutherford developed an experimental design of their own to study how the fish react to stress behaviorally and in response to anxiety drugs. Aponte said that long-term, the research could have implications for the development of anxiety drugs for humans. How do genes contribute to making bacteria resistant to antibiotics? Harleen Aujla, of Portage, a 2018 biology graduate who plans to apply to medical school, is researching the prevalence of certain antibiotic-resistant bacteria with Jenny Fisher, Ph.D. The researchers are collecting bacteria from sewage samples and looking for the antibiotic-resistant populations they wish to study. They also look for the presence of certain genes that play a role in antibiotic resistance. Studies have shown that certain genes contribute the rise of resistant strains of bacteria, so the researchers use a technique called polymerase chain reaction (PCR) to amplify and detect those resistant genes and produce a positive control so they can better study those populations. Aujla said the research opportunities for undergraduates are plentiful at IU Northwest. What can DNA tell us about 100-year-old fungi? Joseph Jansky, of Schererville, is a current biology major with aspirations of medical school. He is working with Peter Avis, Ph.D. to examine samples of fungus that are over 100 years old. The goal is to extract and purify enough DNA from these old samples to sequence the genome of these specimens. Jansky extracts the DNA from the specimens and it is sent to another lab for sequencing. Ultimately this process helps the researchers determine whether the species that were classified a century ago would still be classified the same way today. Accomplishing this requires much interdisciplinary work with the chemistry department at IU Northwest and the Pritzker DNA Lab at the Field Museum. Jansky said he appreciates the unique opportunities to participate in research at a level he wouldn’t find elsewhere. Magdalena Barajas, a Class of 2018 biology major with aspirations of medical school, is working with Peter Avis, Ph.D., on classifying a new species of fungi that was discovered by researchers at IU Northwest. The pair are working toward getting the species officially recorded and named, a process that Avis said isn’t something that would garner much interest by funding agencies, but is nonetheless important for science. Avis said they are close to getting the species published with its official name: Russula garyensis, after the city where it was both discovered and studied extensively: Gary, Indiana. “Usually you want to create a name that is somehow helpful for understanding the biology of the species. There aren’t whole lot of physical features that distinguish this species from others and so that’s when we turned our attention to where it grows,” Avis explained. “It appears that its current known distribution is from Minnesota to West Virginia, and it centers right here in Northwest Indiana.